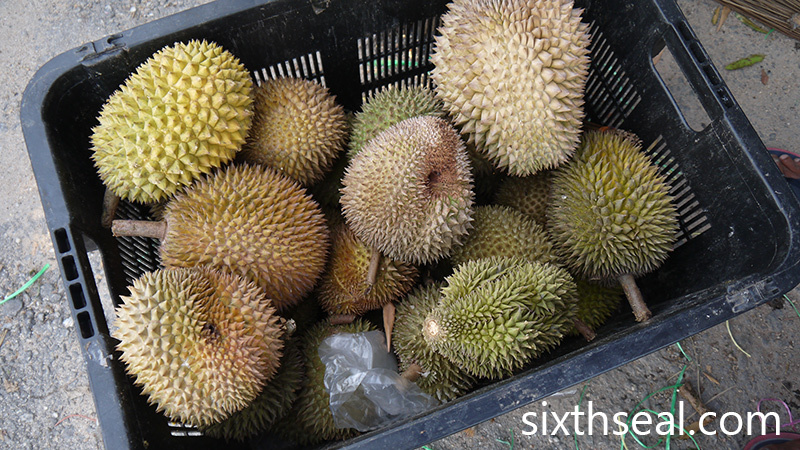 Kampung durians are the catch-all term for all non-cultivated durians. 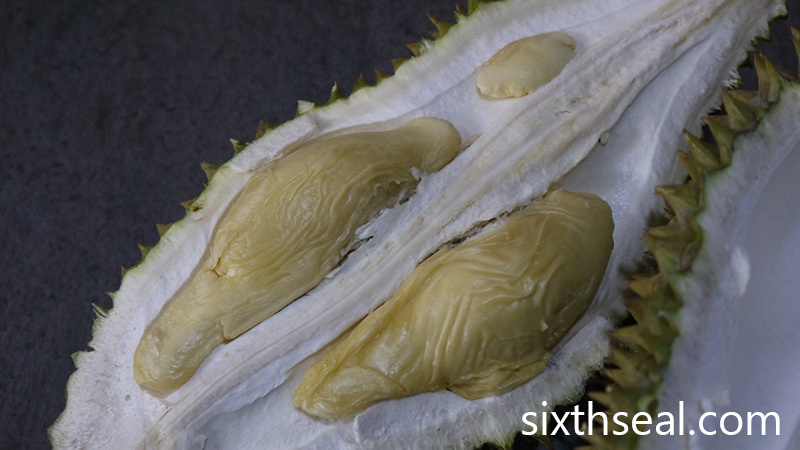 The word literally means “durians from the village”. These are generally not top shelf durian clones but backyard durians or wild durians from the jungle, thus “durian kampung”. 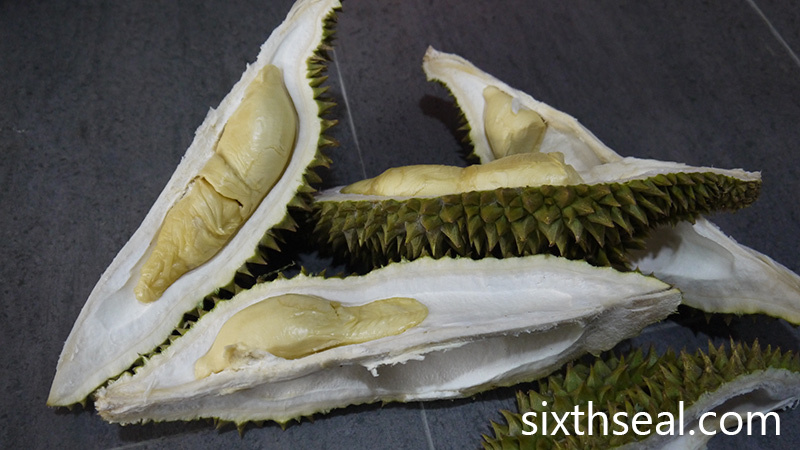 It can also come from orchards which didn’t specifically breed a certain type of durian e.g. D24 or Musang King. Selecting a kampong durian is always a bit like opening up a box of chocolates – you never know what you’re going to get. It’s usually sold in batch e.g. 2-5 for RM 10. These can range from cheap “4 for RM 10” deals to RM 10/kg (depending on quality). I went for the bottom shelf durians this time, with an emphasis on strange or unusual ones and getting as wide a variety as I could. 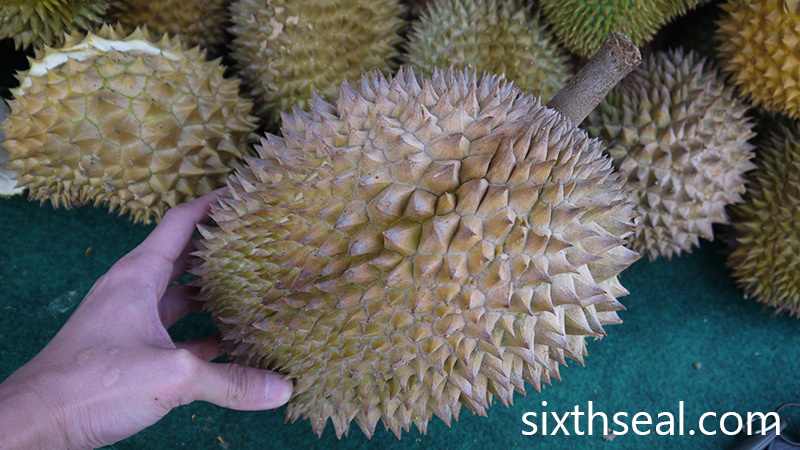 For all I know some of these durians aren’t even durio zibethinus – it could be any other of the edible durian species. 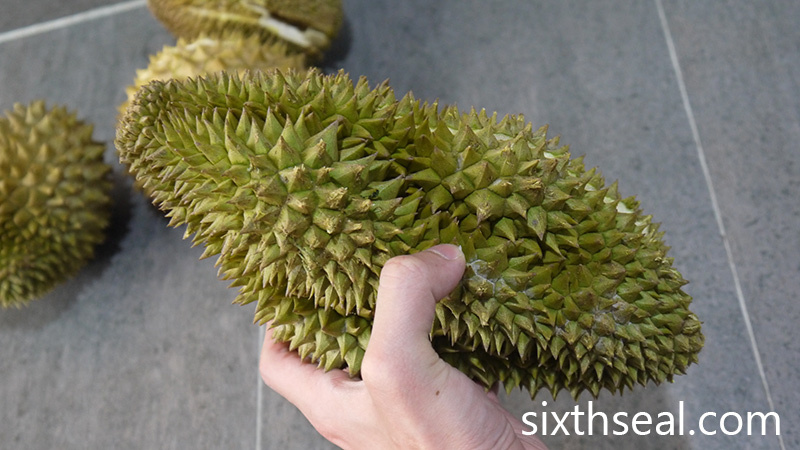 Lindsay from yearofthedurian.com has compiled an exhaustive list of edible durian species and it’s an interesting read for all durian enthusiasts. This batch is my most exciting find. I noticed a durian shaped like a starfruit (carambola) and wondered if it’s the same one that I met in 2012. 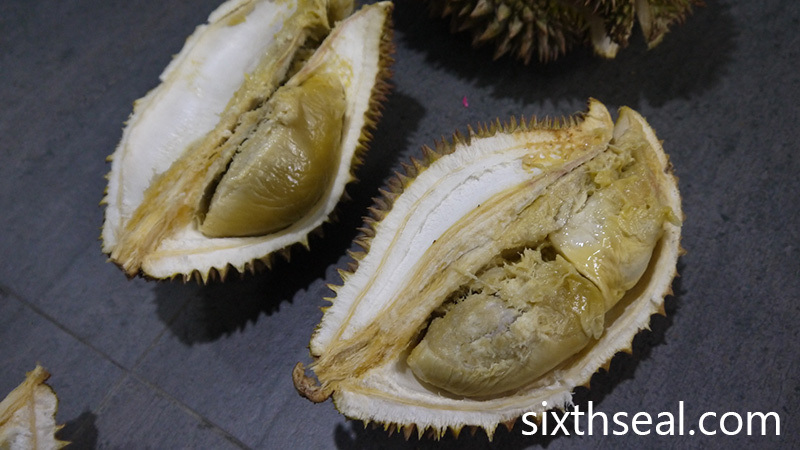 It was called “five star durian” – a direct translation from “mm zhi guo” (which means five fingered durian). The starfruit shaped durian tasted pretty good – the pale flesh was bittersweet and tender, it’s also very sticky, giving a distinctive aftertaste. Each of the five (5) segments have seeds and flesh inside, which was a little surprising considering its size. 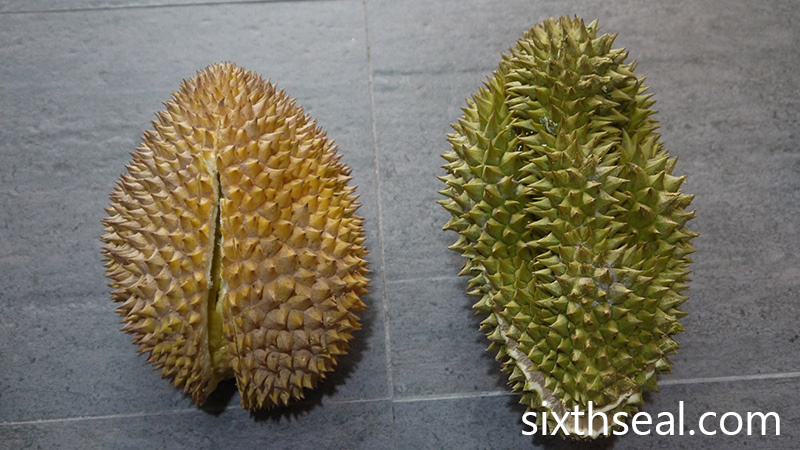 The other durian from this category has a yellow husk and opened up to rather wet flesh with a slight fermented aftertaste and a REALLY STRONG ODOR. 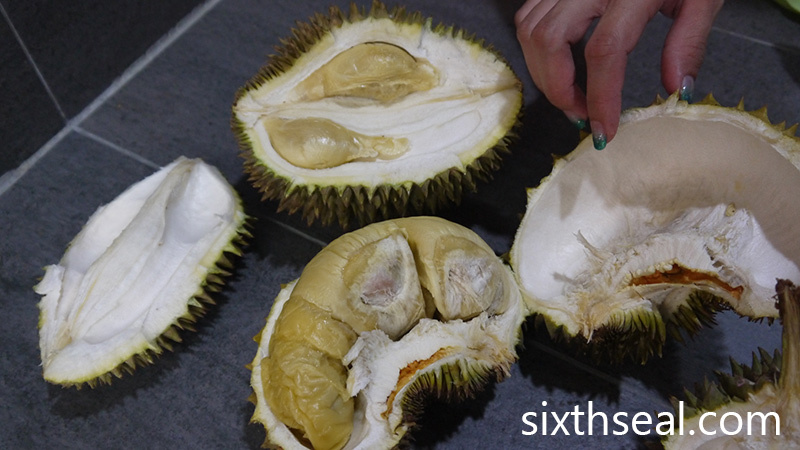 It tasted better when chilled in the fridge for a few hours but eating it requires you to really love durians – it tasted very *intense*. It’s like the Limburger of durians! Interestingly, my better half had tasted Limberger cheese when we went to Germany last year and she couldn’t stand it. She couldn’t stand this either. 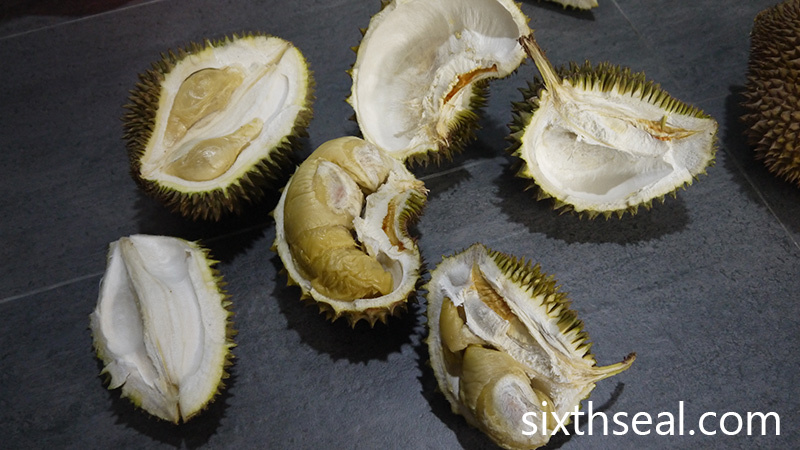 The taste is really breathtaking, in more ways than one – my breath smelled like death for 48 hours after eating this one and I’ve eaten a lot of durians, never to this effect. 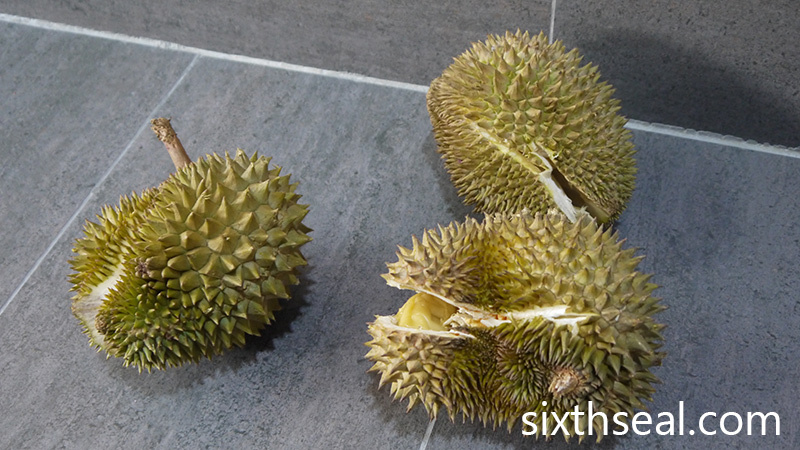 These are the RM 10 for 3 durians. 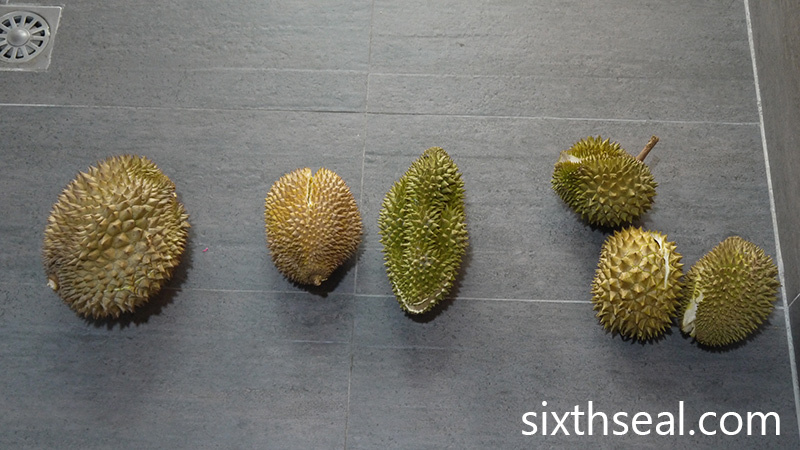 Basically you can pick any three (3) durians for RM 10. These kampong durians are generally smaller in size and I have opened all of them to do a rudimentary check. The first durian was wetter than usual, and very bitter. The second one was slightly sweet and tasted quite nice. The third one had a segment that was spoiled but otherwise tasted fine as well. All three tasted very different and I thought that was part of the appeal of having a kampung durian degustation, although none yielded much meat. 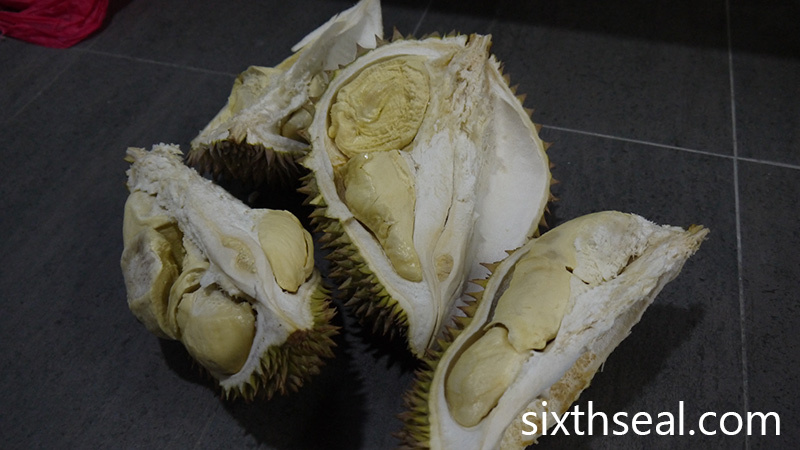 You’ll get better value for money if you just go for the regular durian clones but this was more for experience. This is a larger durian, it weighed in at 1.5 kg and was supposed to go for RM 10/kg but I just picked it out of a basket so they gave me a discount. Unfortunately, the flesh was inedible – it has not yet ripened. I did take a few bites but it was like eating pure starch. The best analogy I can give is if you ate plantains raw vs a Cavendish banana. Life is like a box of chocolates, U never know what u r going to get. Interesting read and u remind me of forrest gump HAHA! You are somewhat a durian expert arent you. I get my durian supplies from my father in law so I’m always eating durian kampung and not those branded ones. I like my durian to be a lil bitter. SHIOK ah! 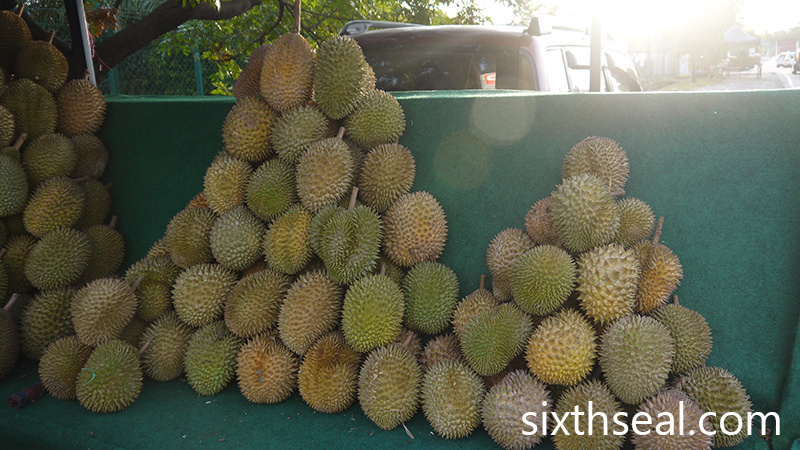 Wah, lagi more durians.. Expert liao you.. Previous years, before I knew about musang king, we were always having kampung durians or “3-for-RM10” durians from the roadside.. D24 was a treat/luxury..